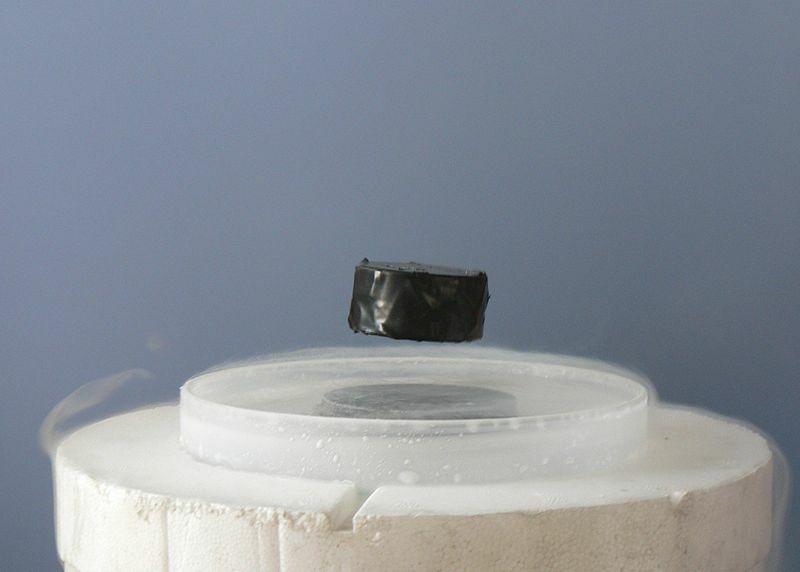 A typical event of the science of physics: a magnet levitating above a superconductor demonstrates the Meissner effect. Physics (Greek: physis – φύσις meaning "nature") is a natural science; it is the study of matter and its motion through spacetime and all that derives from these, such as energy and force. More broadly, it is the general analysis of nature, conducted in order to understand how the world and universe behave. Physics is one of the oldest academic disciplines, perhaps the oldest through its inclusion of astronomy. Over the last two millennia, physics had been considered synonymous with philosophy, chemistry, and certain branches of mathematics and biology, but during the Scientific Revolution in the 16th century, it emerged to become a unique modern science in its own right. 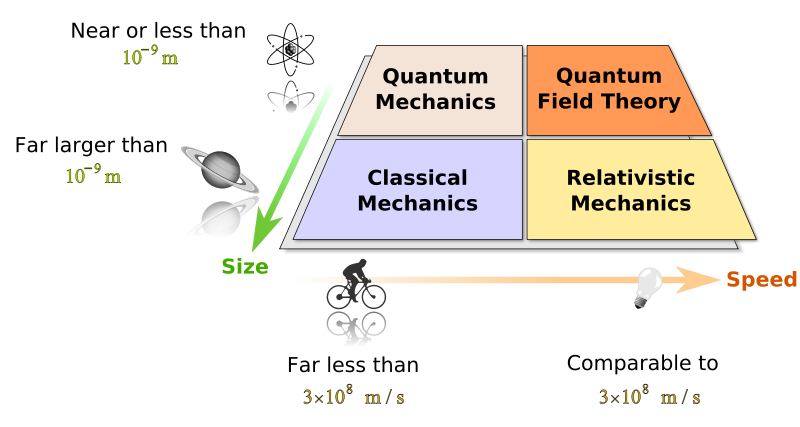 However, in some subject areas such as in mathematical physics and quantum chemistry, the boundaries of physics remain difficult to distinguish. Physics is both significant and influential, in part because advances in its understanding have often translated into new technologies, but also because new ideas in physics often resonate with the other sciences, mathematics and philosophy. For example, advances in the understanding of electromagnetism led directly to the development of new products which have dramatically transformed modern-day society (e.g., television, computers, and domestic appliances); advances in thermodynamics led to the development of motorized transport; and advances in mechanics inspired the development of calculus. This parabola-shaped lava flow illustrates Galileo's law of falling bodies as well as blackbody radiation – the temperature is discernible from the color of the blackbody. Physics covers a wide range of phenomena, from the smallest sub-atomic particles, to the largest galaxies. Included in this are the very most basic objects from which all other things are composed, and therefore physics is sometimes said to be the "fundamental science". 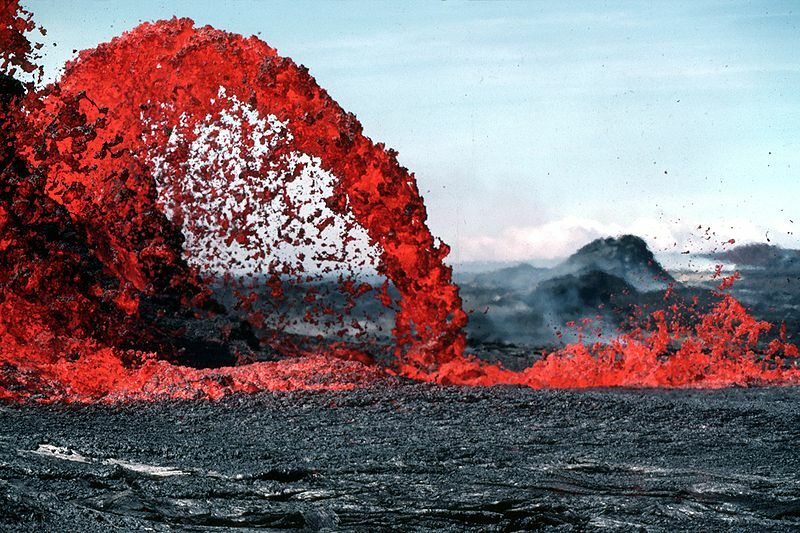 Physics aims to describe the various phenomena that occur in nature in terms of simpler phenomena. Thus, physics aims to both connect the things we see around us to root causes, and then to try to connect these causes together in the hope of finding an ultimate reason for why nature is as it is. For example, the ancient Chinese observed that certain rocks (lodestone) were attracted to one another by some invisible force. This effect was later called magnetism, and was first rigorously studied in the 17th century. A little earlier than the Chinese, the ancient Greeks knew of other objects such as amber, that when rubbed with fur would cause a similar invisible attraction between the two. 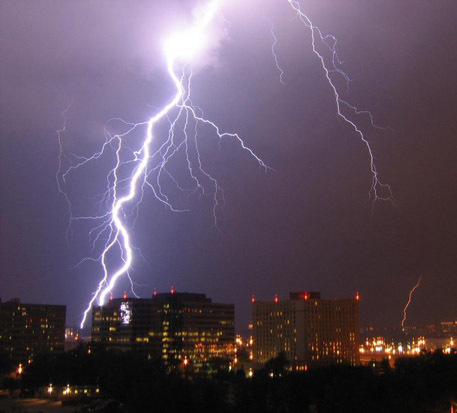 This was also first studied rigorously in the 17th century, and came to be called electricity. Thus, physics had come to understand two observations of nature in terms of some root cause (electricity and magnetism). However, further work in the 19th century revealed that these two forces were just two different aspects of one force – electromagnetism. This process of "unifying" forces continues today (see section Current research for more information). Physics uses the scientific method to test the validity of a physical theory, using a methodical approach to compare the implications of the theory in question with the associated conclusions drawn from experiments and observations conducted to test it. Experiments and observations are to be collected and matched with the predictions and hypotheses made by a theory, thus aiding in the determination or the validity/invalidity of the theory. Theories which are very well supported by data and have never failed any competent empirical test are often called scientific laws, or natural laws. Of course, all theories, including those called scientific laws, can always be replaced by more accurate, generalized statements if a disagreement of theory with observed data is ever found. The culture of physics has a higher degree of separation between theory and experiment than many other sciences. Since the twentieth century, most individual physicists have specialized in either theoretical physics or experimental physics. In contrast, almost all the successful theorists in biology and chemistry (e.g. American quantum chemist and biochemist Linus Pauling) have also been experimentalists, although this is changing as of late. Theorists seek to develop mathematical models that both agree with existing experiments and successfully predict future results, while experimentalists devise and perform experiments to test theoretical predictions and explore new phenomena. Although theory and experiment are developed separately, they are strongly dependent upon each other. Progress in physics frequently comes about when experimentalists make a discovery that existing theories cannot explain, or when new theories generate experimentally testable predictions, which inspire new experiments. In the absence of experiment, theoretical research can go in the wrong direction; this is one of the criticisms that has been leveled against M-theory, a popular theory in high-energy physics for which no practical experimental test has ever been devised. It is also worth noting there are some physicists who work at the interplay of theory and experiment who are called phenomenologists. Phenomenologists look at the complex phenomena observed in experiment and work to relate them to fundamental theory. Theoretical physics is closely related to mathematics, which provides the language of physical theories, and large areas of mathematics, such as calculus, have been invented specifically to solve problems in physics. Theorists may also rely on numerical analysis and computer simulations. The fields of mathematical and computational physics are active areas of research. Theoretical physics has historically rested on philosophy and metaphysics; electromagnetism was unified this way. Beyond the known universe, the field of theoretical physics also deals with hypothetical issues, such as parallel universes, a multiverse, and higher dimensions. Physicists speculate on these possibilities, and from them, hypothesize theories. Experimental physics informs, and is informed by, engineering and technology. Experimental physicists involved in basic research design and perform experiments with equipment such as particle accelerators and lasers, whereas those involved in applied research often work in industry, developing technologies such as magnetic resonance imaging (MRI) and transistors. Feynman has noted that experimentalists may seek areas which are not well explored by theorists. In the Assayer (1622), Galileo noted that mathematics is the language in which Nature expresses its laws. Most of the experimental results in physics are numerical measurements and theories in physics use mathematics to give numerical results to match these measurements. Physics relies on mathematics to provide the logical framework in which physical laws can be precisely formulated and predictions quantified. Whenever analytic solutions of equations are not feasible, numerical analysis and simulations can be utilized. Thus, scientific computation is an integral part of physics, and the field of computational physics is an active area of research. A key difference between physics and mathematics is that since physics is ultimately concerned with descriptions of the material world, it tests its theories by comparing the predictions of its theories with data procured from observations and experimentation, whereas mathematics is concerned with abstract patterns, not limited by those observed in the real world. The distinction, however, is not always clear-cut. There is a large area of research intermediate between physics and mathematics, known as mathematical physics. Physics is also intimately related to many other sciences, as well as applied fields like engineering and medicine. The principles of physics find applications throughout the other natural sciences as some phenomena studied in physics, such as the conservation of energy, are common to all material systems. Other phenomena, such as superconductivity, stem from these laws, but are not laws themselves because they only appear in some systems. Physics is often said to be the "fundamental science" (chemistry is sometimes included), because each of the other disciplines (biology, chemistry, geology, material science, engineering, medicine etc.) deals with particular types of material systems that obey the laws of physics. For example, chemistry is the science of collections of matter (such as gases and liquids formed of atoms and molecules) and the processes known as chemical reactions that result in the change of chemical substances. The structure, reactivity, and properties of a chemical compound are determined by the properties of the underlying molecules, which can be described by areas of physics such as quantum mechanics (called in this case quantum chemistry), thermodynamics, and electromagnetism. Physics in many ways stemmed from ancient Greek philosophy. 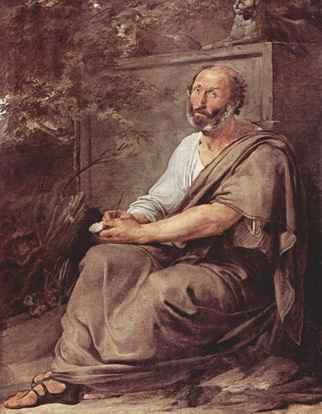 From Thales' first attempt to characterize matter, to Democritus' deduction that matter ought to reduce to an invariant state, the Ptolemaic astronomy of a crystalline firmament, and Aristotle's book Physics, different Greek philosophers advanced their own theories of nature. Well into the 18th century, physics was known as "Natural philosophy". By the 19th century physics was realized as a positive science and a distinct discipline separate from philosophy and the other sciences. Physics, as with the rest of science, relies on philosophy of science to give an adequate description of the scientific method. The scientific method employs a priori reasoning as well as a posteriori reasoning and the use of Bayesian inference to measure the validity of a given theory. Many physicists have written about the philosophical implications of their work, for instance Laplace, who championed causal determinism, and Erwin Schrödinger, who wrote on Quantum Mechanics. The mathematical physicist Roger Penrose has been called a Platonist by Stephen Hawking, a view Penrose discusses in his book, The Road to Reality. Hawking refers to himself as an "unashamed reductionist" and takes issue with Penrose's views. Since antiquity, people have tried to understand the behavior of the natural world. One great mystery was the predictable behavior of celestial objects such as the Sun and the Moon. Several theories were proposed, the majority of which were disproved. Early physical theories were largely couched in philosophical terms, and never verified by systematic experimental testing as is popular today. Many of the commonly accepted works of Ptolemy and Aristotle are not always found to match everyday observations. Even so, Chinese and Indian philosophers and astronomers gave many correct descriptions in atomism and astronomy, and the Greek thinker Archimedes derived many correct quantitative descriptions of mechanics and hydrostatics. A more experimental physics began taking shape among medieval Muslim physicists, while modern physics largely took shape among early modern European physicists. While physics deals with a wide variety of systems, there are certain theories that are used by all physicists. Each of these theories were experimentally tested numerous times and found correct as an approximation of Nature (within a certain domain of validity). For instance, the theory of classical mechanics accurately describes the motion of objects, provided they are much larger than atoms and moving at much less than the speed of light. These theories continue to be areas of active research; for instance, a remarkable aspect of classical mechanics known as chaos was discovered in the 20th century, three centuries after the original formulation of classical mechanics by Isaac Newton (1642–1727). These "central theories" are important tools for research into more specialized topics, and any physicist, regardless of his or her specialization, is expected to be literate in them. Contemporary research in physics can be broadly divided into condensed matter physics; atomic, molecular, and optical physics; particle physics; astrophysics; geophysics and biophysics. Some physics departments also support research in Physics education. Since the twentieth century, the individual fields of physics have become increasingly specialized, and today most physicists work in a single field for their entire careers. "Universalists" such as Albert Einstein (1879–1955) and Lev Landau (1908–1968), who worked in multiple fields of physics, are now very rare. 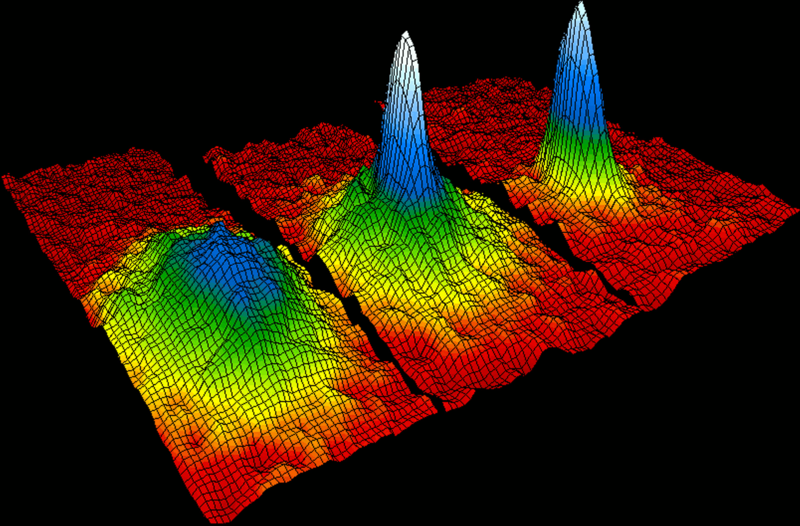 Condensed matter physics is the field of physics that deals with the macroscopic physical properties of matter. In particular, it is concerned with the "condensed" phases that appear whenever the number of constituents in a system is extremely large and the interactions between the constituents are strong. The most familiar examples of condensed phases are solids and liquids, which arise from the bonding and electromagnetic force between atoms. More exotic condensed phases include the superfluid and the Bose-Einstein condensate found in certain atomic systems at very low temperature, the superconducting phase exhibited by conduction electrons in certain materials, and the ferromagnetic and antiferromagnetic phases of spins on atomic lattices. Condensed matter physics is by far the largest field of contemporary physics. By one estimate, one third of all American physicists identify themselves as condensed matter physicists. Historically, condensed matter physics grew out of solid-state physics, which is now considered one of its main subfields. The term condensed matter physics was apparently coined by Philip Anderson when he renamed his research group — previously solid-state theory — in 1967. In 1978, the Division of Solid State Physics at the American Physical Society was renamed as the Division of Condensed Matter Physics. Condensed matter physics has a large overlap with chemistry, materials science, nanotechnology and engineering. Atomic, molecular, and optical physics (AMO) is the study of matter-matter and light-matter interactions on the scale of single atoms or structures containing a few atoms. The three areas are grouped together because of their interrelationships, the similarity of methods used, and the commonality of the energy scales that are relevant. All three areas include both classical and quantum treatments; they can treat their subject from a microscopic view (in contrast to a macroscopic view). Atomic physics studies the electron shells of atoms. Current research focuses on activities in quantum control, cooling and trapping of atoms and ions, low-temperature collision dynamics, the collective behavior of atoms in weakly interacting gases (Bose-Einstein Condensates and dilute Fermi degenerate systems), precision measurements of fundamental constants, and the effects of electron correlation on structure and dynamics. Atomic physics is influenced by the nucleus (see, e.g., hyperfine splitting), but intra-nuclear phenomenon such as fission and fusion are considered part of high energy physics. Molecular physics focuses on multi-atomic structures and their internal and external interactions with matter and light. Optical physics is distinct from optics in that it tends to focus not on the control of classical light fields by macroscopic objects, but on the fundamental properties of optical fields and their interactions with matter in the microscopic realm. 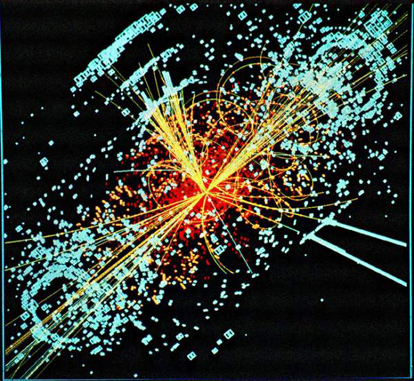 A simulated event in the CMS detector of the Large Hadron Collider, featuring the appearance of the Higgs boson. 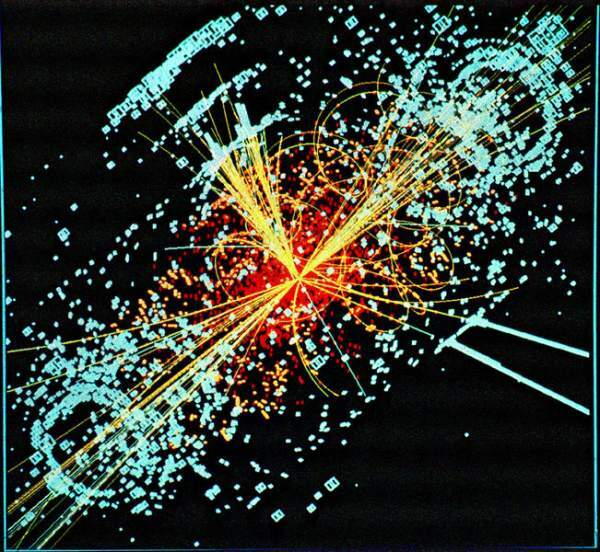 Particle physics is the study of the elementary constituents of matter and energy, and the interactions between them. It may also be called "high energy physics", because many elementary particles do not occur naturally, but are created only during high energy collisions of other particles, as can be detected in particle accelerators. Currently, the interactions of elementary particles are described by the Standard Model. The model accounts for the 12 known particles of matter that interact via the strong, weak, and electromagnetic fundamental forces. Dynamics are described in terms of matter particles exchanging messenger particles that carry the forces. These messenger particles are known as gluons; W and W and Z bosons; and the photons, respectively. The Standard Model also predicts a particle known as the Higgs boson, the existence of which has not yet been verified. The discovery by Karl Jansky in 1931 that radio signals were emitted by celestial bodies initiated the science of radio astronomy. Most recently, the frontiers of astronomy have been expanded by space exploration. 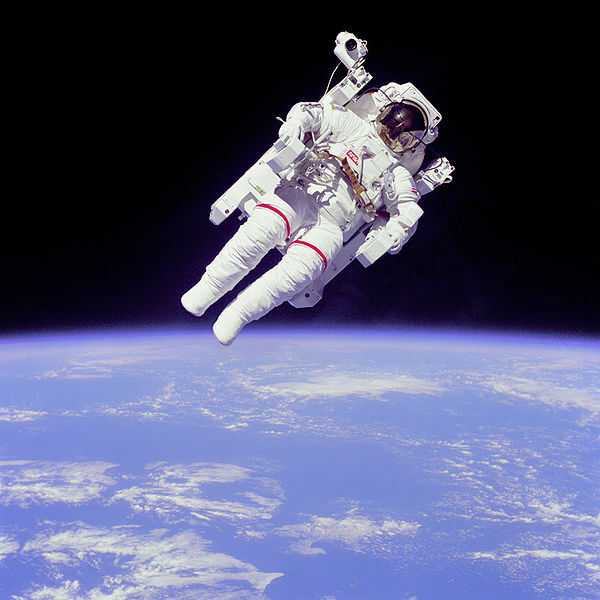 Perturbations and interference from the earth’s atmosphere make space-based observations necessary for infrared, ultraviolet, gamma-ray, and X-ray astronomy. Physical cosmology is the study of the formation and evolution of the universe on its largest scales. Albert Einstein’s theory of relativity plays a central role in all modern cosmological theories. 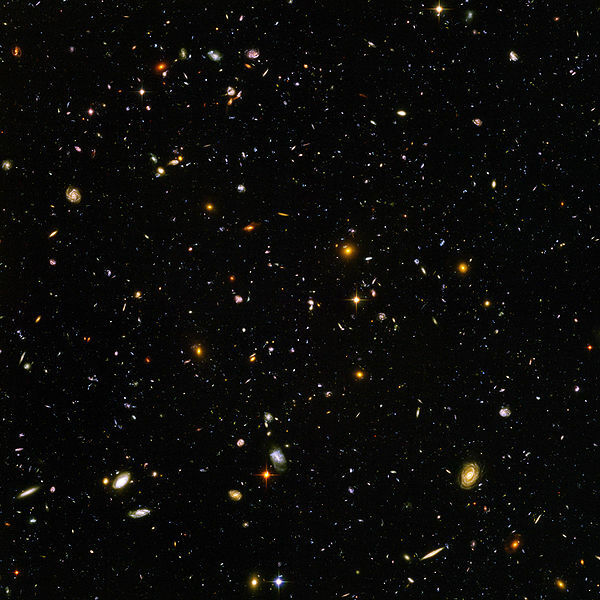 In the early 20th century, Hubble's discovery that the universe was expanding, as shown by the Hubble diagram, prompted rival explanations known as the steady state universe and the Big Bang. The Big Bang was confirmed by the success of Big Bang nucleosynthesis and the discovery of the cosmic microwave background in 1964. The Big Bang model rests on two theoretical pillars: Albert Einstein's general relativity and the cosmological principle. Cosmologists have recently established a precise model of the evolution of the universe, which includes cosmic inflation, dark energy and dark matter. Among the basic issues of physics, which no longer are an active research field, but generally accepted by all physicists, and already introduced at high school, are (i) the contributions which Albert Einstein in his theory of relativity made from 1905 on (and in the following years), considering the nature of spacetime, and (ii) those of Max Planck, Erwin Schrödinger, and others (from 1900 on) concerning the nature of quantum phenomena. Archimedes' screw uses simple machines to lift water. Applied physics is a general term for physics research which is intended for a particular use. An applied physics curriculum usually contains a few classes in an applied discipline, like geology or electrical engineering. It usually differs from engineering in that an applied physicist may not be designing something in particular, but rather is using physics or conducting physics research with the aim of developing new technologies or solving a problem. The approach is similar to that of applied mathematics. Applied physicists can also be interested in the use of physics for scientific research. For instance, people working on accelerator physics might seek to build better particle detectors for research in theoretical physics. Physics is used heavily in engineering. For example, Statics, a subfield of mechanics, is used in the building of bridges and other structures. The understanding and use of acoustics results in better concert halls; similarly, the use of optics creates better optical devices. An understanding of physics makes for more realistic flight simulators, video games, and movies, and is often critical in forensic investigations. With the standard consensus that the laws of physics are universal and do not change with time, physics can be used to study things that would ordinarily be mired in uncertainty. For example, in the study of the origin of the Earth, one can reasonably model Earth's mass, temperature, and rate of rotation, over time. It also allows for simulations in engineering which drastically speed up the development of a new technology. But there is also considerable interdisciplinarity in the physicist's methods, and so many other important fields are influenced by physics: e.g. presently the fields of econophysics plays an important role, as well as sociophysics. In particle physics, the first pieces of experimental evidence for physics beyond the Standard Model have begun to appear. Foremost among these are indications that neutrinos have non-zero mass. These experimental results appear to have solved the long-standing solar neutrino problem, and the physics of massive neutrinos remains an area of active theoretical and experimental research. In the next several years, particle accelerators will begin probing energy scales in the TeV range, in which experimentalists are hoping to find evidence for the Higgs boson and supersymmetric particles. Many astronomical and cosmological phenomena have yet to be satisfactorily explained, including the existence of ultra-high energy cosmic rays, the baryon asymmetry, the acceleration of the universe and the anomalous rotation rates of galaxies. There are also explicit interdisciplinary relations between physics and other fields, having produced new names. Usually these are self-explaining, e.g. Also in other contexts, e.g. in Archeology, applications of physical methods are frequent, although usually they have not led to an own name. A large number of textbooks, popular books, and webpages about physics are available for further reading.